So maybe you've had spicy chocolate ice cream, loved it so you clicked on this page. Maybe you add cocoa powder to your chili recipes and love it, so you clicked on this page. Maybe you were just wondering what the difference between a regular orange and a blood orange is, so you clicked on this page. Either way, if you like a little heat in your Hershey's (please buy better quality chocolate; I only mentioned Hershey's for the alliteration) and a little blood on your hands, you'll be into this recipe. Unsweetened cocoa powder is an ingredient I've been interested in incorporating into savory dishes for a long time. Wikipedia says, "Cocoa powder contains several minerals including calcium, copper, magnesium, phosphorus, potassium, sodium and zinc," so you can feel good about smothering your salmon (which is also rich in healthy stuff like omega 3 fatty acids) in it. Also, the calorie content is super low. Don't be surprised about that. The calories in chocolate candy bars come from the milk, sugar and various other crap that the cocoa powder is processed with. Without all those calorically high add-ins, cocoa is bitter, rich, and inedible. It's like a spice. You wouldn't eat a tablespoon full of curry powder by itself, but you wouldn't hesitate to dredge you're salmon in it. Dark Chocolate Orange Peels (which I make from scratch with raw cane sugar and dark chocolate- check 'em out) are a favorite sweet snack of my dad's. The peels retain a little bitterness but are candied and citrusy. Similarly, the rich, chocolaty salmon pears perfect with this citrusy salsa. I used blood oranges instead of navel or valencia because they've got a more interesting profile of flavors. They're obviously citrusy and often I find them to be more tart than orange oranges, but they also have a berry-like flavor. Another plus, the red color indicates a higher dose of antioxidants. Mix cocoa powder, cinnamon, cayenne, salt, pepper, and orange zest. completely coat the outside of the salmon filet in the cocoa powder and spice mixture. Sear salmon in lightly greased pan over medium heat on all sides for a total of about 8 minutes or until opaque almost throughout or about. Your goal center temperature is almost 140 degrees but higher quality salmon can be safely consumed at more rare temperatures depending on your preference. Remember that salmon, like most seafood, will continue to cook slightly once removed from the heat so be careful not to overdo it. While the salmon is cooking, combine blood orange, tangerine, onion, cilantro and crushed red pepper. 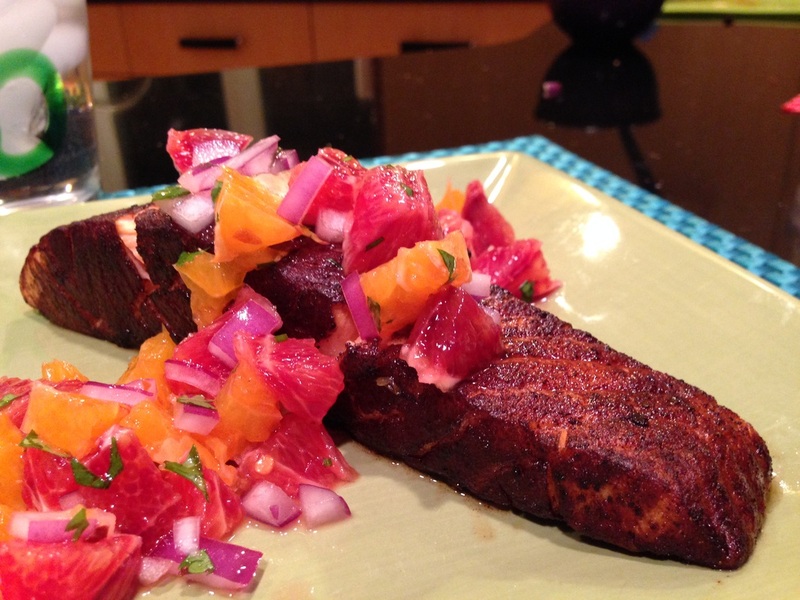 Serve blood orange salsa over salmon filet.